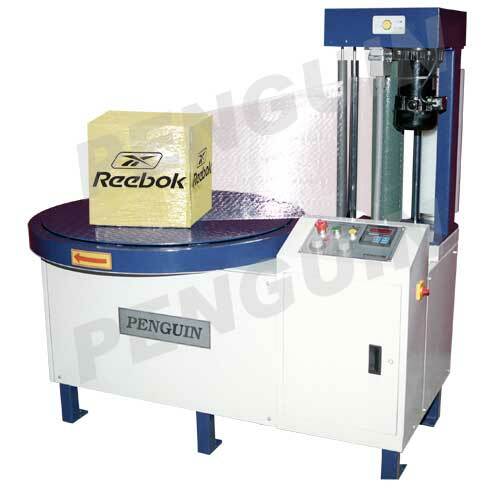 Penguin Pallet stretch wrapping machine is an ideal machine for wrapping pallets, upto high-cube containers, ready to be exported in containers. Also, the stretch film packing is used for protection against perforation, moisture, protection against corrosion from sea air, dust etc. 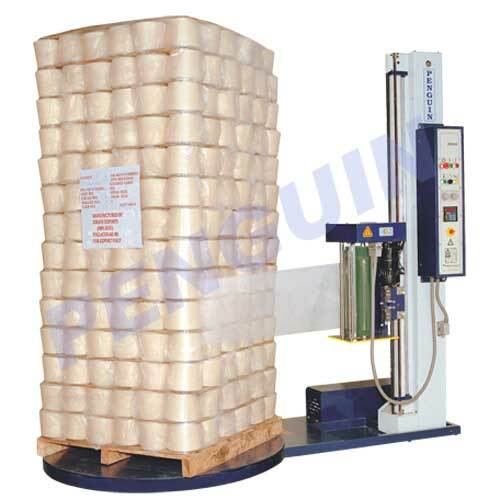 It is ideal for packing products like textile cone yarn, castings, light & heavy engineering goods, pharmaceutical products, electrical & home appliances, sacks containing grains, chemicals, fertilizers, tins containing, fruit pulp, paint, liquids, lubricants, jumbo bags containing products like: activated carbon, granules, powders etc. Penguin pallet wrapping saves costs on stretch film. 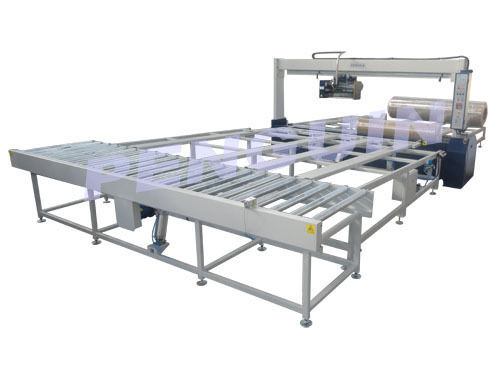 This automatic polypropylene woven roll wrapping machine consists of two modules with automatic roll wrapping section and Roll storage conveyor system. 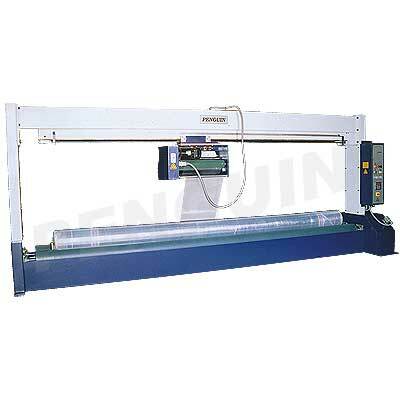 The main feature are Roll wrapper, Roll stopper, Roll ejector, Automatic film cutting and holding device, Automatic film attachment device. The concept of zone conveying eliminates build up of excessive pressure and load on the conveyor systems. The same may be used for carpet rolls and denim rolls. 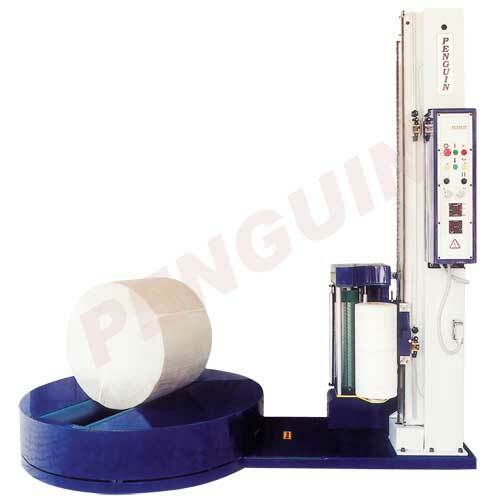 Penguin stretch wrapping machine is ideal for table top model for light carton boxes. Carton boxes which are small to handle are good for products like books, note books, carton boxes, containing pharmaceutical products, electrical & home appliances, light and heavy engineering goods, tins containing fruit pulp, paint, liquids, lubricants etc. 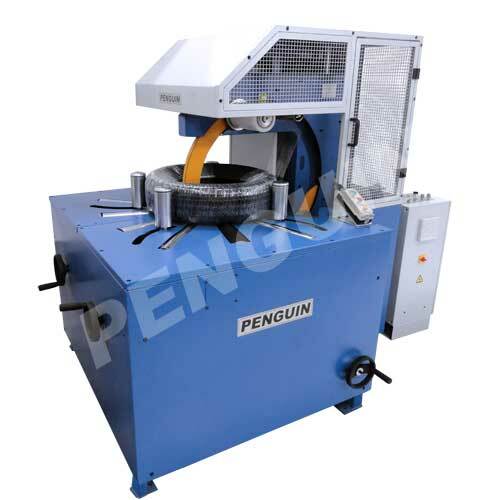 Penguin Reel Wrapper is a machine specially designed for packing paper, film, foil and similar materials manufactured in reels. 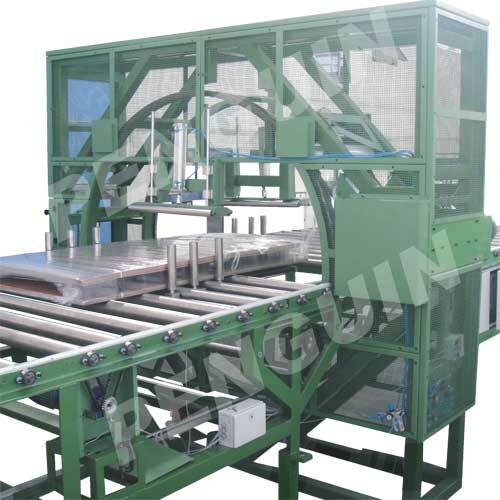 Axial Wrapping: The machine is designed to apply layers of film across the face diametrically and wrap them along the longitudinal axis. The longitudinally applied wraps are moved along the periphery with uniform overlap forming a cocoon type packing. This packing is completely Moisture & Dust proof and protects the product.